Today was a gorgeous, warm, sunny day with high temperatures in the 60's. Tomorrow is supposed to be as warm, but with a chance of rain. Neverthless, this kind of weather in February gives me a serious case of spring fever. In his cookbook, Tyler Florence writes: "I saved some time with this dish by using canned artichokes and making them taste fantastic with a burro fuso (starchy pasta water, butter, and Parmigiano) that coats the artichokes with a thick, buttery glaze. I finish the dish with lemon zest, fresh crabmeat, and mint." Bring a large pot of salted water to a boil. Add the pasta and cook until al dente (follow directions on package). 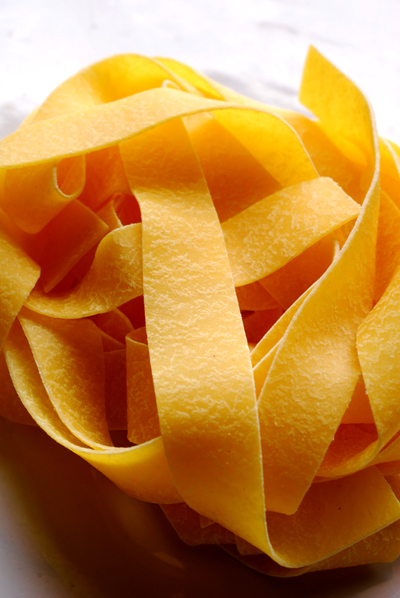 While the pasta is cooking, melt the butter & olive oil in a large skilled over medium heat. Add 1 cup of the pasta cooking water & reduce for 5 minutes to thicken. Add the artichoke hearts, crabmeat, lemon juice, red pepper flakes, and salt & pepper (to taste). Toss and heat until warmed through. Add the cooked, drained pasta to the pan. Stir in the sage & Parmesan and season with more salt & pepper (is needed). Serve with additional cheese for sprinkling! 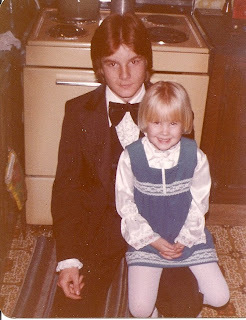 Yesterday would have been my Uncle Eric's 47th birthday. 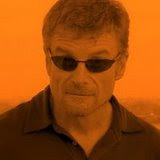 Sadly, Eric took his own life on September 27, 2008. He had lost his home to flooding in New Orleans after hurricane Katrina, and he just never recovered...financial or emotionally. Eric was only about 12 years older than me, so we were kind of close when we were younger. I have lots of memories of playing together at my grandparents' house and on family vacations. 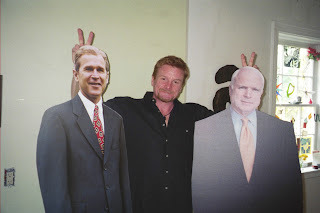 Uncle Eric was one of the most creative people I've ever known. He lived all over the country (Illinois, Florida, Los Angeles, West Virginia, New Orleans) and held a variety of interesting jobs...tee-shirt designer & screen-printer, restaurant owner & chef, landscaper. He was once an extra in a Jermaine Jackson video, which was shot in the L.A. restaurant where he waited tables (he walks by in the background at the 2-minute mark). He once drove Ziggy Marley in a limo to the MTV awards. He once gave me a huge, plastic goose lamp for Christmas and designer-label dresses for my birthday. He once corned a beef brisket, and he made the best curried chicken salad with grapes & almonds. He was once on an episode of Hollywood Squares. He had an intoxicating laugh. 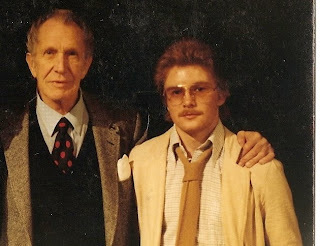 He had, apparently, met Vincent Price in the mid-80's. 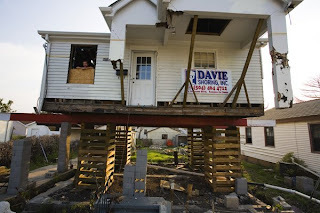 In the few years before Katrina, I visited Eric in New Orleans a couple times. We always had too much fun hanging out. In fact, we sometimes got pretty wild dancing at the gay bars in the French Quarter or bar-hopping in the Alton area when he came back to Illinois. After the hurricane, Eric was determined to rebuild his house. He was downright stubborn about it, always returning to New Orleans despite getting help, employment & housing from friends in San Francisco, in West Virgina, in Florida. For whatever reason, Eric just couldn't recover after losing his home, his job, his relationship, and--for the most part--his sanity. I can't say the news of his death came as much of a shock to me (although, Uncle David did call on the night before my birthday, and I initially thought he was calling with birthday wishes). I think I'd been expecting the call. I was devastated nevertheless...especially since my aunt Nancy, Eric's sister, had asked if he could come stay with me a year or so earlier. I said no because I was dealing with my own loss at the time (loss of my marriage, my friends, my lifestyle), and I didn't think I could provide a stable enough environment for him (I was working 3 jobs and was never home). Yet, I felt guilty for not helping him then. While I am not typically a spiritual person, I'd like to think Eric is in a better place...that he's finally happy and content, and no longer struggling with whatever demons haunted him. Anyway, the first time I went to see Eric in New Orleans, he greeted me and my friend Sue with a home-cooked gumbo dinner. So, in honor of Eric, I made gumbo for dinner last night. * I used a pre-mixed Cajun seasoning that contained many of the same ingredients. 1. Make a roux by melting the butter in a large stockpot or dutch oven over medium heat. Whisk in the flour and cook until foaming. The mixture shouldn't clump up, but should look like a thick liquid. Add a glug or two of olive oil if it's not thin enough. Cook, stirring often, until dark mahogany, about 1/2 hour. Don't be afraid to get your roux even darker than this! 2. Add the peppers, onion, and celery. Cook until soft, about 5 minutes. Whisk in the chicken stock (make sure it’s hot), and bring the mixture to a boil. Reduce the heat to simmer. Stir in Creole Seasoning, black pepper, crushed red pepper, chili powder, thyme, chopped garlic, bay leaves, and kosher salt. Cook, skimming fat as necessary, an additional 25 minutes. 3. 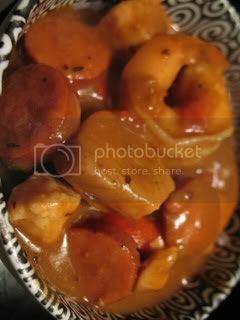 Add the andouille, chicken, & shrimp and cook for approximately 15 minutes or just until the shrimp are cooked. Taste and adjust for seasoning. Serve over steamed rice. Rest in peace, Uncle E. I miss you. Sunday is my favorite day of the week. I usually have a lazy morning, run a few errands, maybe do some baking, make plans for the work week, then cook something fabulous for dinner. Well, at least I try to cook something fabulous. I haven't quite "recovered" from the holidays. I mean, it's been difficult to get back into the swing of things, to keep up with all I have to do for work and then cook & blog on the weekends (especially since I am taking two graduate classes this semester). Plus, I've been fighting illness and stress the past couple weeks. So, I made a point to try a new recipe for dinner tonight. I browsed through all the recipes I have bookmarked on the computer and decided on one I considered making for Thanksgiving. It's a slow-braised dish that turned out tender and flavorful...a comforting meal on a cold Sunday evening. Note: The turkey can be braised 2 days ahead and cooled in sauce, uncovered, then chilled, covered. Reheat in sauce, covered, in a 350°F oven. The past week has been a stressful one for me. I've been sick (and I am not a good sick person), Jerad's been working really late many nights, and work's been particularly trying. But, on the advice of a wise person...I have a new attitude toward it all. From now on, home will be my drama-free zone. I'm going to grade papers and complete lesson plans each day at work so that I don't have to bring home huge stacks and do hours upon hours of research, reading, and worksheet-making like I did this past weekend. So, tonight, I came home sans school-work and did one of the most therapeutic things I found lately...I baked a cake. 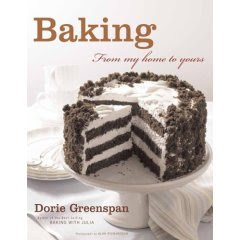 For this week's Tuesdays with Dorie recipe, Stephanie of Confessions of a City Eater chose Devil's Food White Out Cake, the cake pictured on the cover of Dorie Greenspan's Baking From My Home to Yours. This triple-layer chocolate cake is frosted with a marshmallow icing then coated with cake crumbs. I made a couple slight modifications, using only two layers and sprinkling the finished cake with crushed Oreo cookies...because, come on...isn't that what the cake above reminds you of? The fluffy icing was much easier to make the stove-top version I tried in for the chocolate peppermint cake in December. This is made by beating egg whites in a stand mixer then drizzling in a boiling simple syrup mixture. Easy...and so yummy! I did have one snafu, however. Even though I removed the syrup as soon as it hit 235 degrees, it had already started to caramelize. So, my frosting was tan color (with a caramel flavor) instead of bright white. Oh, and I thought a full tablespoon of vanilla was too much...it made the frosting taste a little boozy when eaten straight. Though, that's not really a bad thing! In the end, while this wasn't the prettiest cake I made it was a damned tasty one! Speaking of cakes...here's the cake I made for one of my classes after we'd read Jonathan Swift's "A Modest Proposal." On, and, it was a red velvet cake! I'm so bad.